1 deck. Difficult. No redeal. Exiled Kings Solitaire uses one deck (52 cards). You have 4 foundations. You also have 8 tableau piles with 6 cards in each pile. Aces and the newly-turned cards are placed in the foundation piles in the course of dealing. Cards are dealt to tableaus by columns. Whenever a card is put on a foundation the next row is skipped. So the completed rows don't have the same length. To build the foundations up in suit to Kings. The top cards of tableau piles are available to play. You may build tableau piles down regardless of suit. You can move only one card at a time. When a tableau becomes empty you can fill the space with a King. 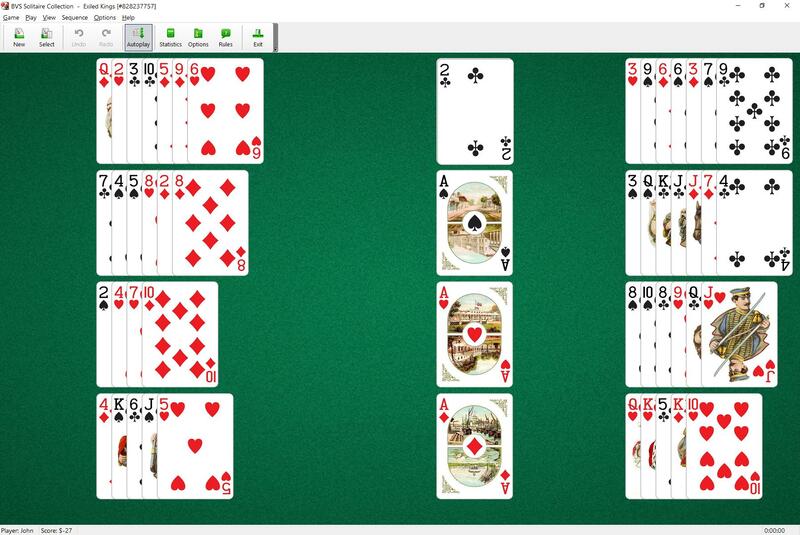 This solitaire game is similar to Citadel with this one exception: When a tableau becomes empty you can fill the space with a King.